Easter is right around the corner, and that means eggs are everywhere, and not always the diet-friendly versions. I wanted to share this simple and tasty recipe the entire family will enjoy. If you love deviled eggs but don’t love that you can only have a few before you meet your macro requirements, this recipe will appeal to you. The traditional deviled egg recipe can be pretty calorie dense, but they don’t have to be. I created a healthy version you can enjoy, completely guilt free! What I love is you can eat six of them or 12 halves without sabotaging your daily fat and calorie allowance. 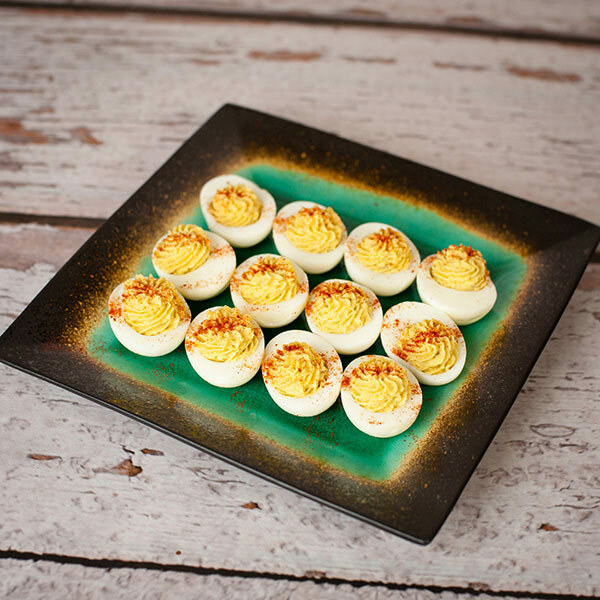 A typical single deviled egg has 150 calories. With this recipe, it’s only 27 calories per egg! If you wanted to enjoy all 12 halves, this would actually make a perfect high-protein, low-carb meal with 325 calories and 28 grams of protein! Talk about winners … I hope you love them as much as I do! Boil eggs until hard-boiled, then remove from heat and allow to cool. While eggs are being hard-boiled, steam or microwave cauliflower until super soft. Once eggs are cooled, remove all yolks but one and set aside. Add cooked cauliflower, 1 yolk, avocado, mustard, pepper and celery salt in food processor and puree until fully combined and creamy. Scoop into egg halves, then top off with paprika. Serve and Enjoy!